The menu here is diverse. You can have grilled cheese ($4.50), beef and macaroni (ummm), souvlaki, gyro, burgers, BBQ, nachos and more. I’d recommend the Greek options. The Red Door makes their own dinner rolls every day – they were as big as my head and great when dipped in the restaurant’s own “Greek Italian” salad dressing (Mr. Marinara’s idea). But, the best part of the meal was the dolmades (stuffed grape leaves). Our waitress assured me that they were made in-house (some people at our table doubted this assertion) – and they were great. The spanakopeta and gyro meat was good too. 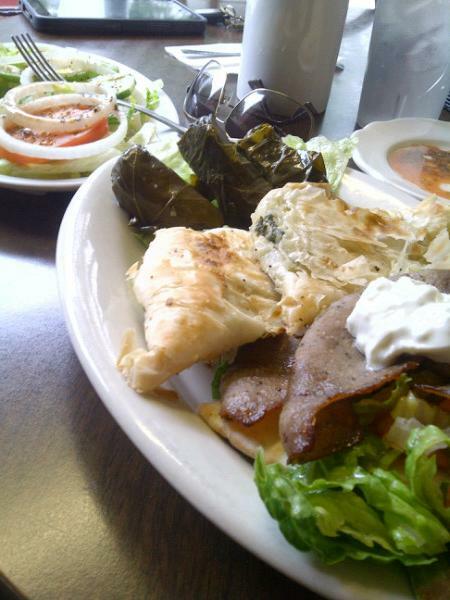 My “Greek Sampler” platter was $10 and it came with spanakopeta (spinach pie), 3 domales, 1/2 of a gyro pita and a side salad. Mr. Marinara had a sensible salad with a side of plate envy. His blog really is worth looking at – www.TheMarinara.com and @themarinara on twitter. Put in an address for these places, bub. Yeah. I often forget that. Thanks, chief. 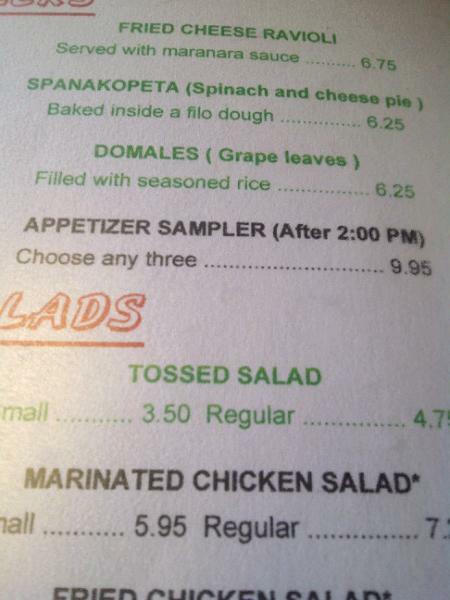 That is a typo on their menu, its spelled d-o-l-m-a-d-e-s. Though pronouncing it quickly (thickly) with a greek accent sounds the same. Interesting. Thanks. I've only known them as dolma before this.